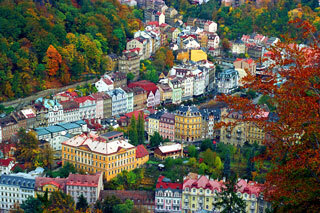 Karlovy Vary or Carlsbad is a spa town situated in western Bohemia, Czech Republic, on the confluence of the rivers Ohre and Teplá, approximately 130 km (81 mi) west of Prague (Praha). It is named after Charles IV, Holy Roman Emperor and King of Bohemia, who founded the city in 1370. It is historically famous for its hot springs (13 main springs, about 300 smaller springs, and the warm-water Teplá River). It is the most visited spa town in the Czech Republic. This article uses material from the Wikipedia article "Karlovy Vary", which is released under the Creative Commons Attribution-Share-Alike 3.0 License.